Laura Cassidy won the Richardson Dilworth Award for Innovation in Government. Chief Inspector Joseph Sullivan, who headed police response to the papal visit and the Democratic National Convention, was honored Tuesday for his 33 years in the Philadelphia Police Department. Sullivan was one of three recipients of the Richardson Dilworth Awards, which recognize full-time, executive-branch employees. Sullivan's Distinguished Public Service honor comes with a $5,000 stipend from Dilworth Paxson LLP and Independence Blue Cross. An additional award for Innovation in Government was given to Laura Cassidy, sustainability manager for the Philadelphia Department of Prisons; an award for customer service went to Joanne Dahme, general manager for public affairs at the Philadelphia Water Department. Cassidy and Dahme each receive $1,000 prizes. Sullivan's job is enormous. He is responsible for the Police Department's bomb disposal and special weapons units, Dignitary Protection, SWAT, and Civil Affairs. He serves as a point of contact on FBI matters. On Tuesday, he spent more than 20 minutes thanking the many members of the department, past and present, who have helped him. Officers from the department filled the back of the ornate Mayor's Reception Room in City Hall. "I'm sincerely grateful - feeling humility beyond belief and a certain degree of embarrassment, and that's only because I have the greatest job in the Police Department, probably the greatest job in policing," Sullivan said, pausing to collect himself. "And you look at the back of that room, you know why." 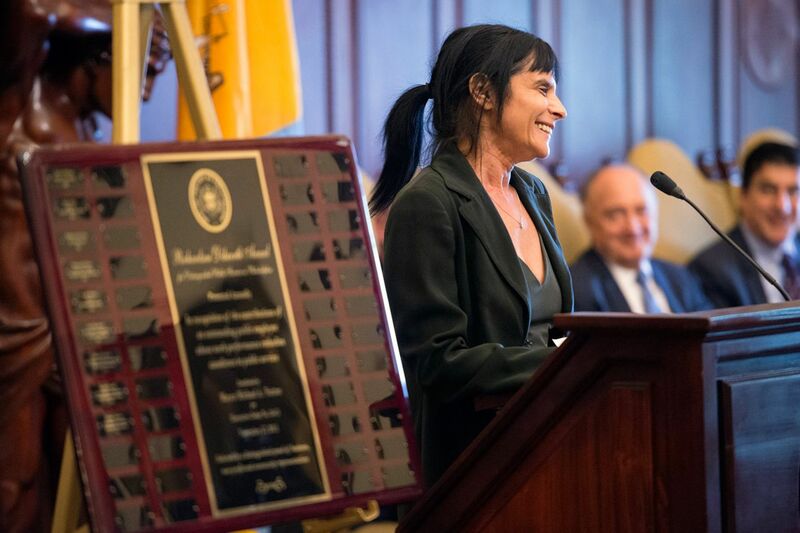 Cassidy received the award for Innovation in Government for her work bringing a recycling program to the city's prisons and an orchard to the main prison complex in Northeast Philadelphia. With 7,500 inmates on any given day, the system has a huge environmental footprint, which Cassidy has helped reduce, Prison Commissioner Blanche Carney said during a ceremony in the Mayor's Reception Room. When Cassidy started 21 years ago, Philadelphia prisons had no recycling program. Now the system recycles 300 tons of waste a year. Under her guidance, two acres of vacant land was turned into an orchard at Philadelphia Industrial Corrections, complete with 200 fruit-bearing trees and chickens. Inmates who work in the orchard or in composting can receive a vocational certificate through Temple University's horticultural department in partnership with the prison. Cassidy thanked several inmates who participate in that program. "I don't like to call them inmates," she said. "I like to call them my coworkers. . . . Jamel, Jacob, Lloyd, they put their hearts and souls into this program, and they've taken ownership of this program. And hopefully, upon completion, I will never see them again." Dahme, who has spent 34 years at the Water Department, received an award for excellence in customer service. She is the point of contact for residents and communities during all water emergencies. Dahme was the first chair of a citywide flood-risk management task force, which is now addressing issues in Eastwick and Germantown, two neighborhoods that have suffered after heavy storms. She started her career as a Villanova University engineering student interested in helping the Schuylkill and Delaware Rivers, thinking what a great job it would be. Her father was not as happy. "We spent all these college dollars for you to work" in a sewage plant? she recalled her father saying, noting he used a word a bit cruder than sewage. "I said, It's a water pollution control plant!"